What are news organizations doing to increase user activity and engagement on their Facebook pages? To be clear, a large part of any Facebook strategy focuses on newsfeed visibility and on-site promotion through tactics like EdgeRank optimization, frictionless sharing, like and subscribe buttons, Open Graph tags, Facebook Comments and other Facebook Social Plugins. However in this post I want to focus primarily on tactics that are geared towards the Facebook page itself. I’ve gathered together some examples that I’ve come across lately or have had exposure to in the past. Recently NPR shared a case study on Nieman Journalism Lab showing how they used geotargeting on their Facebook page to specifically target users in one local market, Seattle. I won’t rehash all the details but their testing helped to set traffic records for member station KPLU, increased engagement and changed the nature of the comment discussions since more users were personally connected to the content. Geotargeting isn’t a natural fit for every news organization, but for those with content that will appeal to specific areas and those that publish in multiple languages it is worth experimenting with. 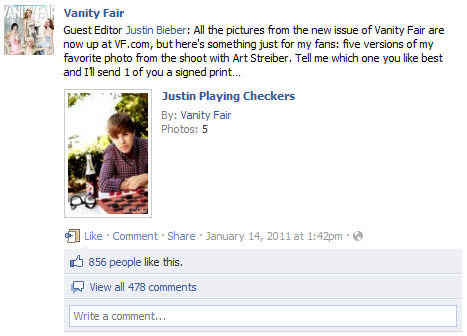 Last year Vanity Fair drew a lot of attention when they made Justin Bieber guest editor of their Facebook page for a week in conjunction with his cover story in the magazine. Michael Hogan, Vanity Fair’s executive digital editor at the time, shared the results on a conference panel I moderated last year. Admittedly the young pop star’s fan base wasn’t the perfect demographic match for Vanity Fair but the promotion proved highly successful. Not every media outlet has access to the Justin Biebers of the world, but in any topical or geographic area there are newsmakers or influencers that would be a good fit. 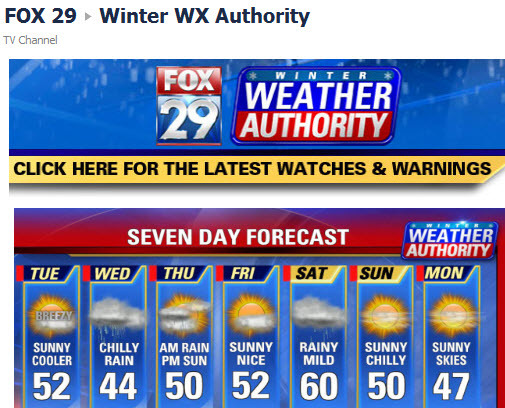 This one is a bit more about EdgeRank optimization than page-specific tactics but it is a good example. Print publishers, particularly magazines, have a powerful draw that they can use to their advantage: people love to see their name in print. 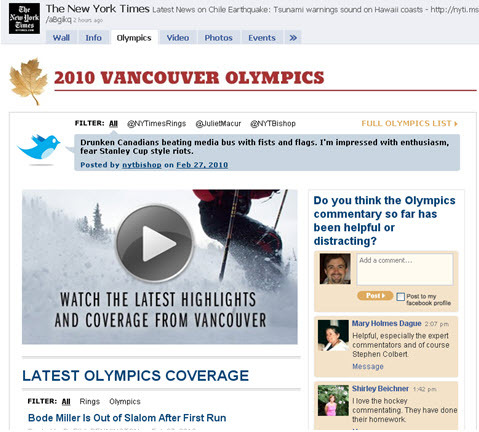 Forrester’s Melissa Parrish, formerly Director of Community Strategy for Time Inc. Digital Lifestyle, shared this example on a conference panel we were on a couple years ago. You have to be careful not to over-use it but done conservatively it is a nice tool for fostering engagement. The tactic also works for Web properties but there is something about mentions in print that still resonates strongly with people. It’s a good fit for broadcast too, as local news stations often share user comments from their Facebook pages (and Twitter) on the air. 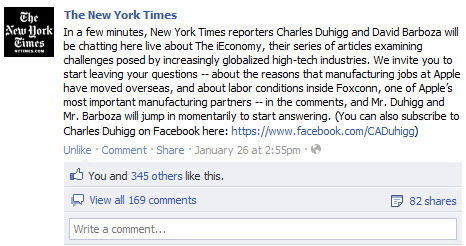 Poynter recently did a write-up on The New York Times’ use of live chats on their Facebook page. According to Social Media Editor Liz Heron the chats have been a successful experiment, although it is not the best format for every scenario. Chats are a good way to give users a specific reason to come to the page and they create the opportunity for multiple touchpoints (promoting the chat, doing the actual chat, posting a post-chat wrap-up, etc.). 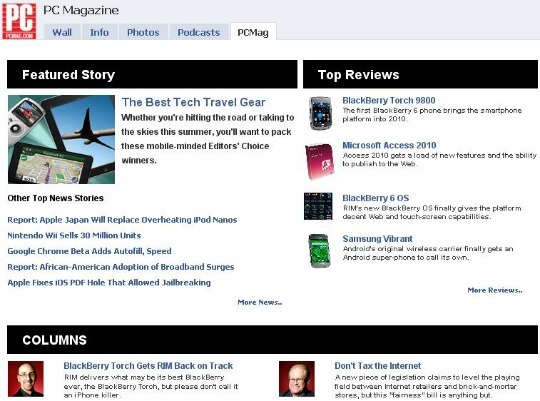 Creating additional Facebook tabs with a welcome message or some extra functionality is a common practice. Specific to media outlets, creating tabs for special content or features is an effective tactic for generating repeat visits. They stopped doing it but I always thought it was a nice format. 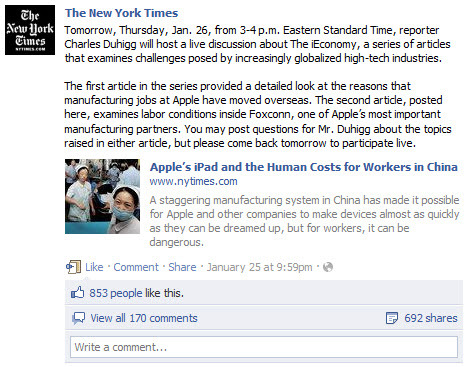 Last year The New Yorker experimented with Facebook-only articles using a reveal tab for users that liked their page. I’m less in favor of this idea simply because it is beneficial for sites to build up permanent link and social signals for all their content on their main site. But it is good to experiment. For another idea outside of news see Grateful Dead Facebook Page: Great Use of Interactive Content. 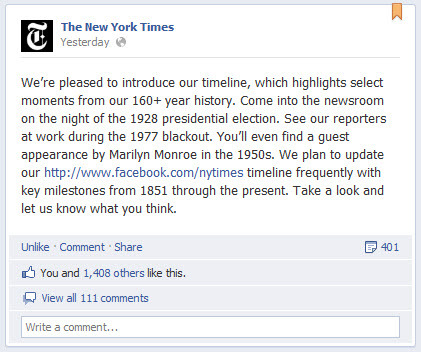 The day after I published this post The New York Times transferred its page to the Timeline format, which all brands now have to do within 30 days. Seems like there is a lot of potential there and it will be another good way to increase activity on their actual Facebook page. These are some tactics that I find useful. What else are you doing with your Facebook page? Thanks for sharing this kind of informative stuff. Really helpful.